Sometimes great food combos just come to you. And sometimes it's a process. This one formed over multiple events - me loving coconut milk bubble tea but hating paying $3.50 for it, chatting with Susan from Knitting Night telling me to cook tapioca in coconut milk, reading the tapioca box's instructions and ignoring them, and then finally seeing my treasured tub of nutella. This warm dessert is perfect for the cold weather! & it's the easiest recipe - - because I wouldn't have it any other way. 3 ingredients, 3 steps, and then EAT. 1. Combine everything in a sauce pan over medium heat. 2. Stir constantly until it's at a full boil. 3. Turn off the heat and let it cool town. After 10-20 minutes (or longer), eat! The tapioca will continue to expand the longer you let it sit - - and the flavors will blend more and be more delicious! We really enjoy it heated up the next day when the tapiocas DOUBLE in size! But if you eat it 10 minutes later, it'll still be delicious. As with any recipe, do this to your taste. If you do it equal parts milk/tapioca, it'll be thick like pudding and you'll need a spoon to eat (especially the next day when the tapiocas expand - you might need to add in more milk when you reheat!) If you add in a lot more milk in the beginning, it'll be more like a delicious drink - no spoon necessary! See what you prefer. And feel free to add LOTS of nutella if you're an addict. Josiah and I recently took a super short vacation to gather with his side of the family in Tahoe, California. While we were making dinner together one night, his brother Ben (who works at one of my favorite food places) stopped me as I was cutting up some bell peppers for shish kabobs. He politely mentioned that there's a much more effective way to cut them. What, you mean my "cut around the top stem and try to shake out all the seeds" method wasn't the best? Ha. This might not seem like that big of a change - but I had to cut 6 bell peppers that night - and there was no "shake out the seed" mess happening! This way really simplifies the process. He called it the "box method". 1. Cut off the bottom. This makes it so your bell pepper can stand all on it's own, usually even if it's a wonky shaped one! 2. Cut off "side 1". You're going to be cutting off all 4 sides, making this the "box method". 3. Cut off "side 2". 4. Cut off "side 3". 6. Discard the core and seeds! Admire all your lovely bell pepper chunks. And cut them up more as needed. Plus you can still use the bottom that you cut off. Seriously, that's all! No cutting around the stem and then digging out the seeds. This will leave most seeds in the middle with the stem, and great rectangle pieces for you to cut as you need! You can cut the big pieces in half or thirds and they are perfect for dipping - or in thin slices for lovely fajitas. Frozen grapes are delicious. I've been eating them since I was little and have loved them during every Texas summer. No, this isn't a recipe - because there is no recipe! It's just a reminder to eat these because they are fantastic. 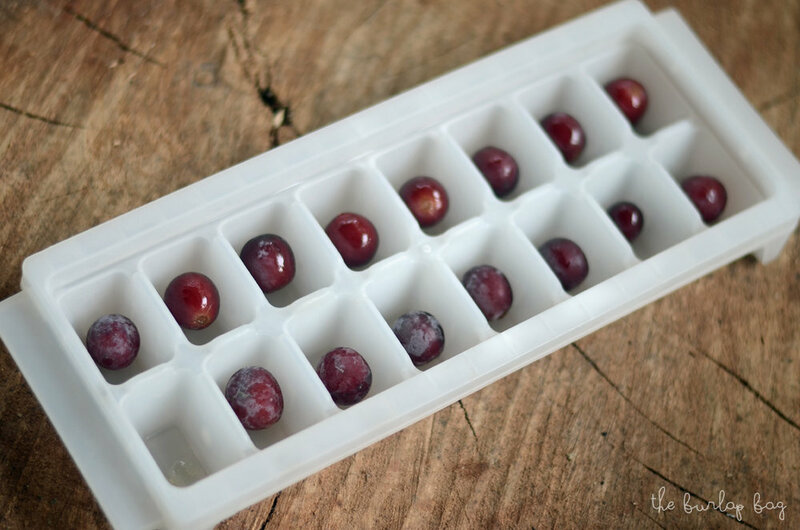 Just put your (clean) grapes in the freezer! It's suggested to dry them off after washing so they don't stick together in the freezer - but ain't nobody got time fo that, especially when we don't use paper towels in our house (gasp, weirdos, i know). I always have a thousand ice cube trays lying around, so last time I made some, I just stuck one in each little cube holder thingy. Pretty genius if ya ask me? Then when I want a nice treat, I just grab a hole tray and enjoy! -They have a different consistency (a nice icy chew, kinda like ice cream in a weird way?) -It's slower to eat them (I can eat 100000s of normal grapes in 5 minutes like nobody's business. They are also expensive. Here, you have to enjoy slowly!) -Some say they taste a little sweeter, but this may just be because you're eating them slower and enjoying the grapey taste :) -A very healthy snack! -PERFECT for the hot summer! So many of our current readers found us because of our 2 ingredient cookie - which I made up because I was sick of all the "healthy" cookies that still had like a thousand "mandatory" ingredients. I decided to come up with one that only had 2 mandatory ingredients - - and then whatever delicious mix-ins you want! And YES. I know. I know. I know. I know that there are more than 2 ingredients in my cookie. Thank you for letting me know in the comments like a thousand times - I did graduate kindergarden and even college and can count past 2! It's a miracle. But the base is just 2 ingredients - plus YOUR choice of more, if you want. and then whatever other ingredients you want! Options that sound great: walnuts, brown sugar, chocolate chips, cinnamon, sea salt, coconut flakes, pecans, raisins, smothered with nutella or peanut butter right before you eat...... or whatever else you want! Our favorites (same in our original 2 ingredient cookie and our autumn 2 ingredient cookie) to mix in are cinnamon, chocolate chips, and nuts. 1. Mix everything up! Equal-ish parts of peaches and oatmeal. If you’re using a lot of “mix-ins”, you might need to add in more peach goop (yes i just said goop in a recipe) so it’s not too dry. 2. On a greased cookie sheet, cook them for 12-15 minutes at 350 degrees. Obviously, cook longer if they are still a little mushy in the middle! -We put our peaches in the blender so the peaches would get real liquidy - but with a few nice peachy chunks here & there. I'm sure you could use canned peaches or peach pie filling! We even left the skins on - you can see the little pink pieces in the pictures. -Quick oats definitely hold together better - but you can use regular oats if you'd like. I'd suggest chopping them up a little in a food processor/blender/on a cutting board so that they hold together better. -do NOT forget to spray your pan (or use parchment paper). You'll hate yourself if you forget/choose to ignore me. Oatmeal is like GLUE! And as with a lot of recipes, this is a little bit of trial and error to best fit YOU! Change the mix-ins, add in more peach, cook a little longer, turn your oven up more, make smaller cookies, smush the cookie "dough" down, etc. Also, you should probably put these in the fridge within a couple of hours. The peach keeps them pretty moist, which means they could mold fast. Or, bright idea, just eat 'em! Mmm. Here's a fresh & super simple salad that you can eat endless amounts of. AND IT TASTES SOOOO GOOOOOOD. That's my kind of meal. We've eaten what we've named "extreme caprese salad" for at least 15 of the past 30 dinners, seriously. You can just add different things here and there and it takes on a new taste. We love love love it. Spinach, lime juice, raw onions, beans, olive oil, salt, rice, I mean SERIOUSLY ANYTHING. We cut up all the veggies into bite sized pieces, shred the cheese (I definitely prefer little pieces everywhere to a big ole chunk of cheese. I want it in every bite! ), and tear the bread up small. We then mix everything together and the avocado makes an amaaaazing coating for everything, almost into a giant guacamole? Then consume consume consume. Just with a fork. Or your face. This is one of those simple little life hacks/tips and tricks that are like "oh. duh. WHY DIDN'T I THINK OF THAT SOONER??!" Picnics are awesome. I'm especially fans of one that include an Austin skyline, lots of fruit, salami, CHEESE, and boxed wine. And a calm dog or two. Ok and dessert. But you always gotta bring a knife for that cheese. I don't know how many times I've been like "uh, what do i do with the knife?" and just awkwardly stuck it in my bag... hoping to not accidentally stab myself to death. I actually got this idea from a book - they mentioned to use two wine corks. Which I then tried and almost sliced my finger off.... it was so dry, there was no getting the knife in there! So I thought for a minute about what else I could use... a carrot! We just sliced through the carrot with the entire blade until the knife was halfway through the carrot - and then just stopped so that it stayed in there. Carrots are thick enough that it won't continue going through all on its own. (you could also try a squash or something like that, but they aren't quite as hard). And when you get back home, just eat the carrot! No wasting! And no blood. It's what I would call a perfect day. Go enjoy yourself a good picnic for me, no blood please. Josiah and I have been eating raw oats for breakfast for 3 weeks now... and love eating them every morning! They have the same "softness" as when you cook oats on the stove (or in the microwave, you sicko you), but these aren't cooked - just soaked overnight. Every recipe I've seen had like a bajillion ingredients, and I like things SUPER basic.... and then you can add in whatever YOU like! Eating oats raw is healthier since you're not cooking out more of the good stuffz. Now before you get yourself in a tizzy about how the oats aren't actually raw because the manufacturer usually slightly heats them before they go to the grocery store.... calm it down. By "raw" oats, we just mean that we aren't heating/cooking them at all. The recipe is SO easy! Just tweak it to your own palate. Soak overnight: equal parts LIQUID and OATS. Put them in the fridge if there's dairy or something that says to keep cold once opened, like soy milk. Liquid options: Milk, almond milk, soy milk, coconut milk, hemp milk, water, apple juice, and many more I'm sure! Mix-in options: ENDLESS! honey, cinnamon, & pecans are some of our favorites. You could add ground flax seed, chia seeds, bananas, peaches, raisins, spices, brown sugar, coconut... and more and more. We add in our mix-ins the night before - we've been adding honey and it soaks into the oats and tastes amazing. If you find that in the morning, it's "not wet" enough, you can add in more liquid right then! We put 1/4 cup of regular oats & 1/4 cup of some milkish thing in a mason jar and it's perfect for us. nutella + milk + heat = AMAZING hot chocolate! Nutella is like the crack of desserts. Just like bacon is the crack of meats. Avocados - the crack of vegetables. Ok I'll stop before I get too hungry. Back to Nutella. It's amazing. Josiah and I will seriously just eat a (small) spoonful of it for dessert after a long day at the shop. And when it's cold outside (which is like 2 days so far this year in Austin), what's better than hot chocolate? No, what's better than HOT CHOCOLATE MADE WITH NUTELLA! Nutella + milk + heat = amazing hot chocolate. That's seriously all there is to it. Pour some milk in a pan. Put in a gob of nutella. There's no measurements for this. If it's looking too "milky", add some nutella. 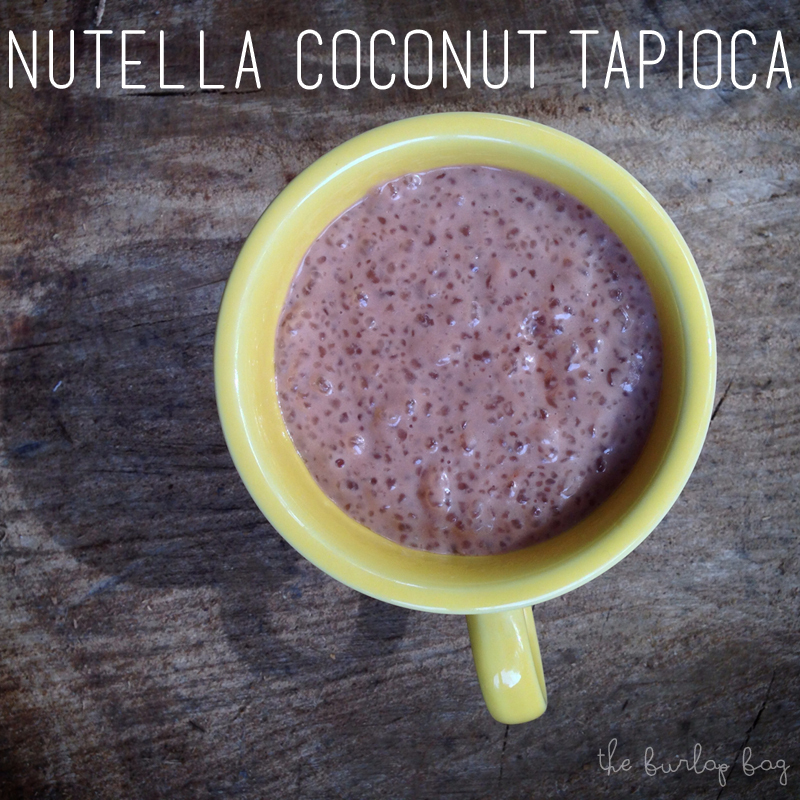 Taste it and if it's too "nutellay" (not possible...), then add more milk. As you heat up the milk and nutella, the nutella will melt/dissolve into the milk. Give it a couple of minutes and you'll have some lucious looking hot chocolate. And it will taste AMAZING and so hazelnutty. Do you see that gob of nutella? Yeah, I put another one in there later because it neeeeeeded more hazelnut/chocolatey goodness. We've been doing this since last year and a couple of days ago.... I had a genius idea. Add in some peppermint schnapps to make it a "peppermint hot chocolate"... (and boozy hot chocolate. hey don't judge me it's been a long & crazy week!) Ummmm it's delicious. If you're not feeling particularly boozy/you're growing a child/you think alcohol is evil/ you think 10am is too early for a drink, you can always use peppermint syrup! No alcohol there. I"m sure this would be amazing with some whipped cream on top too - but that would require more work on my part. And just the nutella and milk is so so so so so so so great tasting. YES, it's worth all of those so's! Don't buy those terrible powdered fake chocolate packets for hot chocolate again. Go try it for yourself. You won't regreat it. It's so easy. I told you another tutorial diy life hack pinteresty project was finally coming your way this Thursday... and here I am, at 9:44pm writing it. I'm a true procrastinator. Sue me. It'll probably take me longer to write this post than it even took to do the whole tutorial! My reward when I'm done writing this = animal crackers. Buckle up: Homemade breath mints. Josiah and I have been using these for 2 weeks now and we LOVE them! powdered xylitol - - - or powdered sugar. (small blurb on xylitol - thanks to our friend nick for introducing it to us! you can find it at any health food store... whole foods, wheatsville if you're here in town. it's a sugar alcohol and supposedly safer for diabetics! it's "tooth friendly" and in a lot of gums and toothpastes and mouthwashes - as it's good for oral health. it actually REDUCES plaque on your teeth. It almost has a "cold" taste by itself. yes, a sugar that's GOOD! yay. google it for more info, i'm just a crazy person blogging, not a doctor) If you don't wanna get xylitol, just use powdered sugar. It won't have the health benefits but it will work as a powdered-non-sticky-substance-thing. ok. back to the diy breath mints. Step 2: Mix it/knead it until it's all one solid mass of "dough". If it's too dry, add a little water. Too wet, add more gum paste mix. Common sense here, people. Step 4: Flatten it like a pancake on a surface of powdered xylitol/powdered sugar on wax paper. You could use a rolling pin but those things are my worst enemy! I always get everything all stuck to the roller. So I just flattened it with my hands. Make it the thickness of a normal breath mint.... maybe 1/4 of an inch? Step 6: Lightly toss them in the leftover xylitol/powdered sugar that's on your wax paper. This helps them not stick together. Step 7: Let them dry out for a couple of hours. They are pretty much ready to eat - but if you want them to get a bit harder, just leave them out. Then ENJOY ENJOY! You can add different extracts for different flavors! Add cinnamon instead of peppermint. Strawberry. Lemon/lime for a sour (ew, personally). -These are actually GOOD for your teeth! -They are easy to make. I know this tutorial was a little lengthy for "The Burlap Bag standards", but it's worth it. I bet it would be fun with kids too! -Add in food coloring if you're so inclined! I'm working on figuring out a recipe that DOESN'T include gum paste.... But who knows when that'll come alive. I'll keep you updated. For now, I'm off for some animal crackers. And then maybe a breath mint. Go freshen that breath. You stink a little. Yeah you. Last night we were at some friends' house and Josiah smelled a cinnamon stick. Terribly boring story, right?And then he had a brilliant idea. Instead of BUYING ground cinnamon, why not make your own??! It's the easiest thing ever. Seriously. Just put cinnamon sticks on your coffee grinder for one-ish minute... and you'll get a lovely powder of cinnamon. Do it longer if you want even tinier particles! Why not just buy pre-ground cinnamon? You can. We're just going back to the basics with cinnamon bark and grinding it up. And it's just kinda awesome to make it yourself. And really really cheap. We bought a bajillion cinnamon sticks for less than $2. Plus, there's no added preservatives in homemade ground cinnamon. A lot of those containers add some preservatives to prevent from caking/clumping... yuck. If this clumps, just stick it back in the coffee grinder. We realized we use our coffee grinder for so many other uses - diy powdered sugar, diy garlic powder, homemade onion flakes...... it's the "poor-man's food processor" since we don't have one, or the "modern mortar-and-pestle", since we don't have one of those either. Ha! Ok go make your own ground cinnamon! And then go make some french toast, or pumpkin pie, or oatmeal, or cinnamon rolls, or do the cinnamon challenge if you're a crazy person. Our basil plant has been growing all summer long and we finally decided it was time to chop most of it down. (chop? It's not a tree, Lauren, it's a 1 foot tall plant...) We set out to make some pesto, but then realized: we didn't have cheese. Or pine nuts. Or any nuts. So instead, we just chopped up the basil super fine and mixed it with some olive oil. 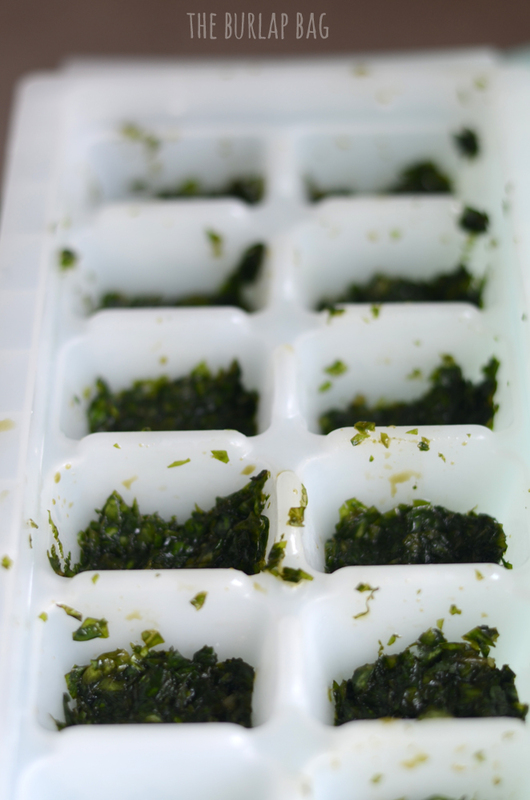 Once they were frozen, we popped them out and stuck them in another container. Whenever we're cooking and want some "fresh" (not really fresh but better than dried store bought basil!) we can just grab one of these frozen cubes. Super fast and easy. We did that the other night with spagetti and it was wonderful! So whenever your plant is big, do all the work at once, and then you're set for a whole season on basil! (or whatever herbs you like! Oregano... mm. Rosemary... mmmm. You could also do this with pesto but you wouldn't wanna freeze it with cheese already in it. Enjoy! Straight to the point: You can REALLY REALLY REALLY easily make your own homemade powdered sugar! Like, in 10 seconds. It's perfect for if you run out of powdered sugar, or if you like to make things homemade yourself and know what goes in them, or if you're just cool. I know I am. Are you ready for it? Get out a spiral and a pen (and some back up pens and a highlighter for doodling) because this gets real crazy intense. Step one: Grind regular sugar in a coffee grinder/blender for 20 seconds. And that's it. Confectioner's sugar. In the palm of your hand/coffee grinder. Some suggest to put in some cornstarch if you need it to be a little thicker/prevent caking (supposedly you need this for icing). So do that if you think it's not the right consistency! 1-2 tablespoons for 1 cup of sugar. But we loved it with just granulated sugar - ground up. Remember this for when you're cooking and realize you have NO MORE powdered sugar for that icing/french toast/whatever else you find on pinterest to bake. And when you get that nice homemade powdered sugar, then make your own POWDERED SUGAR SHAKER! Man. We're just full of great ideas. Ha. No, we're just dorks who do everything ourselves. 1. Mix everything up! 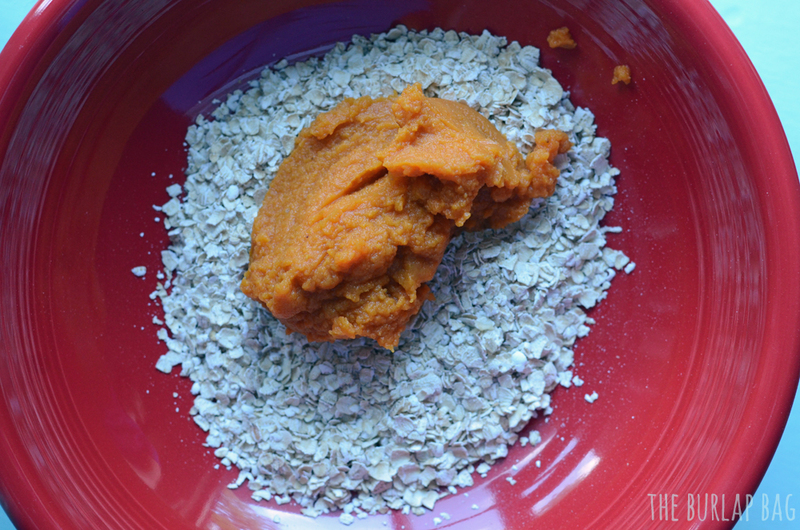 If you're using a lot of "mix-ins", you might need to add in more pumpkin so it's not too dry. 2. On a greased cookie sheet, cook them for 12-15 minutes at 350 degrees. Equal parts pumpkin and quick oats. Make cookie sized amounts onto a GREASED cookie sheet. (you'll hate yourself later if you forget to grease it. Oatmeal is like glue!) These puppies WILL NOT expand - so you can stick 'em pretty close together if you want. then, cook for 12ish minutes at 350 degrees. and DEVOUR! Ours made 14 "cookies", which will all be gone today. Which is ok, because these are healthy! There ya have it. The perfect, healthy autumn cookie. This is another one of those food tricks and life hacks that makes you go "WHAT?!" and then... "Oh duh. Why didn't I think of that?" Ha. Don't worry. Everyone else is in the same dumbfounded boat. You can use a bottle to easily separate an egg yolk from the egg white. This tip actually came from one of our blog readers/artists we have in our shop! Feto Soap's lotion bars are amazing and sell like hotcakes at The Burlap Bag. Thanks Lisa! but Lauren, you can just use the egg shells, you dumb bum! Yes, I know. But I (and lots of other people I'm sure!) have managed to mess that up by getting egg all over my hands, getting an egg shell in there, or breaking the yolk. Plus that way can be time consuming if you're doing a lot of eggs! This takes 1 second per egg. Wasn't that cool? Now go try it yourself. You might mess up once or twice but once you get the hang of it, it'll be amazing! 2 ingredient cookies - plus the mix-ins of your choice! I've spent weeks making sure this recipe is fool proof. It was also an amazing excuse to make these at least once a week.... for 5 weeks in a row. Yes. For real. Two ingredients. (Yes, you can add other things if you want... but you don't HAVE to!) I made this up after seeing a "healthy breakfast cookie" that wanted me to add eggs, applesauce, baking soda, etc and I said NO! And also, I hate those "two/three ingredient" recipes where one of the ingredients is a boxed cookie mix. and the other is a can of pie filling. CMON PEOPLE. Mix those two together. Old bananas are amazing for this, but you can use fresh ones too. I buy a bunch of bananas, let them get old on my counter, and then stick 'em all in the freezer. Since all bananas are different sizes, the needed measurements can vary. If it seems too runny and the cookies would flatten out too much, add in more oatmeal. And make sure to not add in TOO many mix-ins as the cookies won't hold together very well. The ones in these photos have a handful of chocolate chips, a teaspoon or two or cinnamon, and 1/4ish a cup of crushed walnuts. We made 16 cookies with those measurements. We cook them at 350 degrees for 15 minutes on a GREASED cookie sheet. Don't forget the greased part.... I did once and had to scrub my pan forever. post-mixing. You can still see the chunks of 'nanas. post-cooking. check out those walnut chunks! These cookies taste most amazing right out of the oven. But still great later. I wouldn't even know if they taste great 2 days later because they've never lasted that long. Sometimes we'll make 16 "cookies". And we'll eat them all for lunch. I know what you're thinking... WOW lauren you're gonna be 500 pounds if you keep eating 8 cookies. But think about what went in these cookies! If I ate 8 cookies, I've had: 1 banana, 1/2 cup of oats, and half a handful of chocolate chips and walnuts. Amazing. Leave out the chocolate chips and they are all health. Why this recipe is awesome? I'm terrible at eating regular oatmeal. But I'm EXCELLENT at eating cookies! I hope you like these. We love them. Tell us what random "mix-ins" you'd add!! We were super duper excited when we found out you can make homemade garlic powder. It was easy and tasty and preservative-free. And then... we found out you can make.... homemade onion flakes!!! We just saw onion flakes mentioned on some website and found no actual directions... So we made it up. Cuz we can do that. 1. Cut up your onion. We did ours in quarters and then spread out the layers on a pan. You could go crazy and chop 'em up and then spread them out. I'm just lazy. They might dry out faster if they are smaller chunks. 2. Stick them in the oven at the lowest temperature yours will go (mine goes to 150). OR a dehydrator! But we don’t have one of those. 3. Leave it in there for forever. (ok. not forever. I did mine for 2 hours, let them sit in the off oven overnight, and then another hour in the morning.) They should be brittle. Best of all, these have no preservatives, salt added, or whatever else those spice containers have added to them. and done. I'm off to see what other spices you could make.... oh the options! 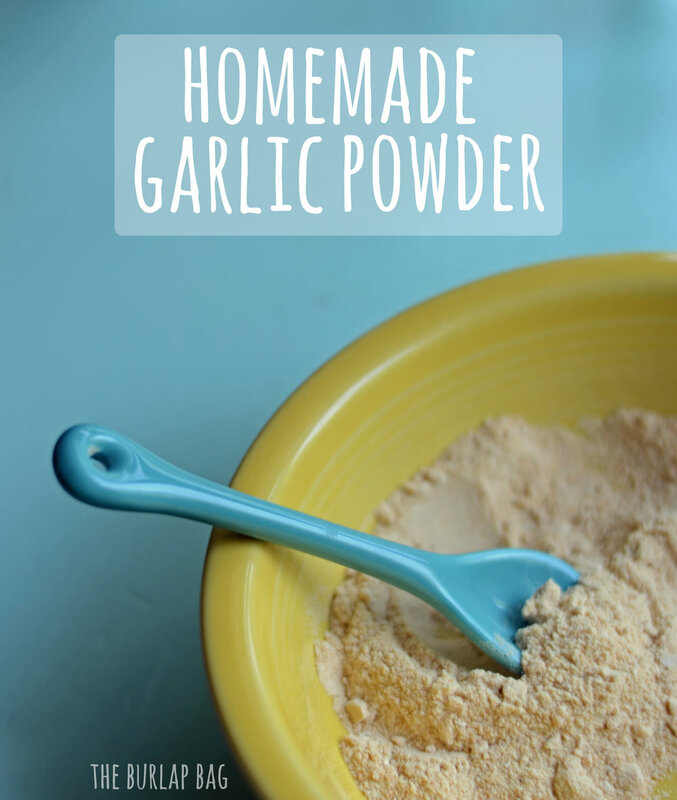 I had no idea until YESTERDAY that you could make your own homemade garlic powder. As soon as I heard about it, I ran and bought some garlic at the nearest grocery store. I needed to test it out and make garlic powder as soon as possible. Anyways, diy garlic powder. so awesome. -Getcha garlic. Lots and lots of garlic. -Cut them into thin, uniform slices. -Stick them in the oven at the lowest temperature yours will go (mine goes to 150). OR a dehydrator! But we don't have one of those. -Then stick them in a coffee grinder. OR a mortar & pestle if you like a good arm workout. 30 seconds in a coffee grinder and you will have garlic powder EXACTLY like the kind you'd buy at the store. Except without the preservatives that some of the store ones have. Yuck, preservatives! Yay, all natural garlic powder! Ok. Now pictures to walk you through it all. Peel them all. you should probably do this while watching a movie. but i just sat there and watched my cats bite each other's faces. And then grind it up! It should be done in 30 seconds if your garlic pieces are truly dry. Then you've got some homemade garlic powder! I stuck mine in a old spice container. Which still smelled of basil. So now I've got basil scented garlic powder. Haha oops. Still just as tasty! Isn't that the coolest food recipe trick thing ever??! Never buy garlic powder again. You could mix in salt and make your own garlic salt jar. Or you could mix in onion & red pepper flakes and salt and make your own yummy seasoning. Well then if you have had any of those "in case"-es happen ever in your life... here's the easiest tutorial ever. And just mix them together! You can just use a fork. It'll look scary in the beginning and you'll think that it will never come out right. BUT IT WILL! Just keep mixin. I actually used my kitchen aid mixer and then a fork to get out super small chunks. And then you'll have fluffy and fresh brown sugar! that's 50 whole cents I'm saving. woohoo. That money can go towards that helicopter you've been eyeing. 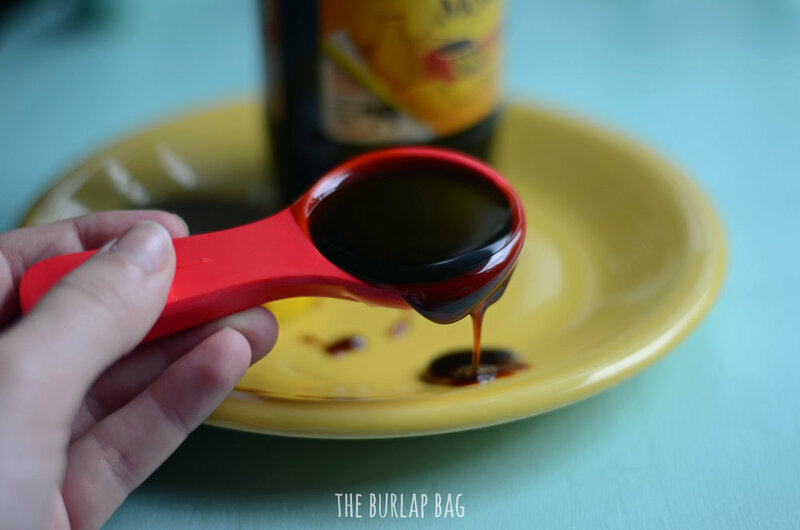 Keep it in a sealed container ... or just make when you need it for a recipe! This tip was given to us by a kind blog reader, Ming! Many thanks, Ming! It. is. so. awesome. Kinda bummed I didn't know about it before now! Well, now I know, and now all of you do too! do not pour molasses into a tablespoon and try to take pictures of it all by yourself while josiah is eating cereal and not able to help. you will have molasses EVERYWHERE. I love pickles. Sometimes, I crave them. And no, I'm not pregnant. They are just awesome. What's even better than regular pickles? Homemade pickles. Homemade bread and butter pickles. Homemade bread and butter pickles that are ready overnight. No canning required! Of course, since it's me and I've got too much going on in life for complicated recipes, this recipe is super easy. I got it from The Hungry Mouse - but I leave out a lot of ingredients. Ha. Suuuueeee meeeeeee. Steps: Wash and dry your cucumbers. I only had 2 in my fridge so I halved the whole recipe when I made it. Put them in a heat safe bowl. Sprinkle them with salt and mix them so the salt gets on all of them. How much salt? I have no idea. Just sprinkle it on all of them. A teaspoonish? You are smart people, you'll figure it out. Then let sit for around an hour. Go hang out on pinterest. The salt will bring out lots of water. The less time you let them sit, the less crunchy they will be. So if you like soggy pickles, skip this step I guess.... After an hour, pour the water out. YOU'VE GOT PICKLES! of course, I put mine in cute lil jars. They will keep for a couple of weeks in the fridge, but honestly, you don't hafta worry about them going bad. You'll eat them too fast! ok. go make some pickles now so you can have them tomorrow.